Each time, it’s a shock. I may keep that same smile on my face, but inside, it’s just painful. Why was I so lucky to be born in France, in a modest but lucky family with all I ever needed from when I was young, and not here, in the middle of that huge garbage dump, in the outskirts of Jakarta? 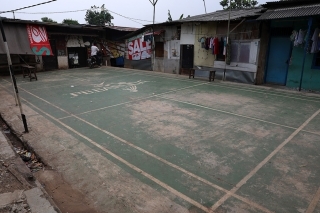 It could have been the other way around, and one of these kids could have my life, travel all around the world, see amazing places, get to meet amazing people, be part of the badminton community while I would be stuck here, with only garbage to recycle all day long, in a hot, humid, stinky environment? Why is that? I feel so lucky, each time I come across the look on these children’s faces – even if, often, they smile. And it strikes me, every time, that they don’t complain. They don’t ask for anything. And I, like so many people I know, complain all life long, for silly things. For nonsense. For lousy photo positions. For a train that’s 5 minutes late. For a steak that’s too cooked. These trips to Bekasi are a shocking reminder on how humble we should all be. How grateful we should be. And appreciate what we have in life. That we shouldn’t judge, too. We, westerners have such big ideas on how the world should be run. That kids shouldn’t work, for instance. Oh yeah? You’re right, children shouldn’t work. They should go to school. But here, some have no choice. It’s either work or die. Work or see your whole family struggle and you feel stupid, useless. Ashamed. Kids shouldn’t steal. Right. On principle. But here, sometimes, they do. Because that’s the only way they can get things – food – when they’re hungry, for some. 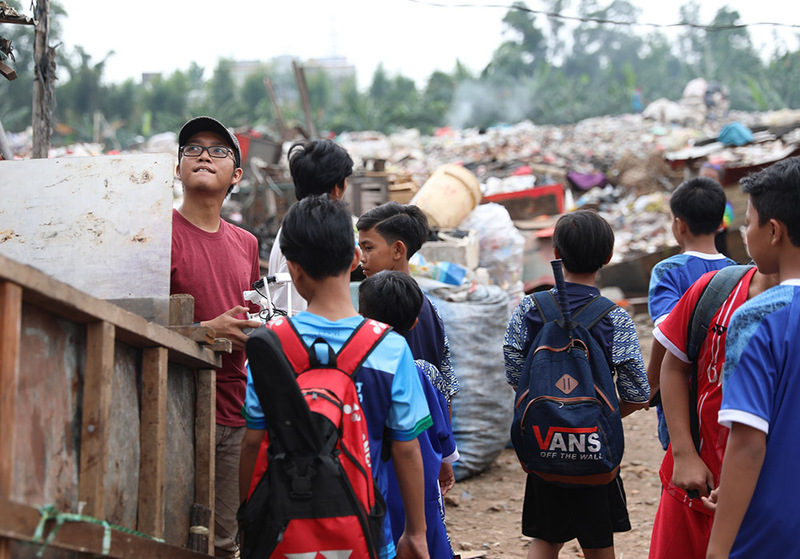 I realized that when Dominique, the Coordinator and fantastic woman behind this Indonesian project with her team, tells me that some kids here are little “thieves” with a smile. Well, I can’t blame them, even if I wish they didn’t have to. But who knows what I would do, if I was born in their “house”. In the mud. In the heat. In a giant garbage. Wouldn’t want to have things like other kids have? Most likely, I would. So would you. So, as far as judgment, I tend to think we should keep our “great” ideas and values for us, sometimes. And appreciate the fact that we have the means to have values. Because we have food, we have a roof, we have a job. I feel humble, thanks to Krisna, Kholik and all the other kids from here. I felt lucky to have the opportunity, once again, to visit them, to meet their parents, in their shelter that we only usually see on TV, in documentaries. I feel grateful that so many people at Solibad are doing so much so that we can make a small difference and I get to see it. This time, with two friends, two top umpires, Iris and Bert. Who were shocked, too. And who took the time, played with the kids, gave them some tips for a wonderful moment. 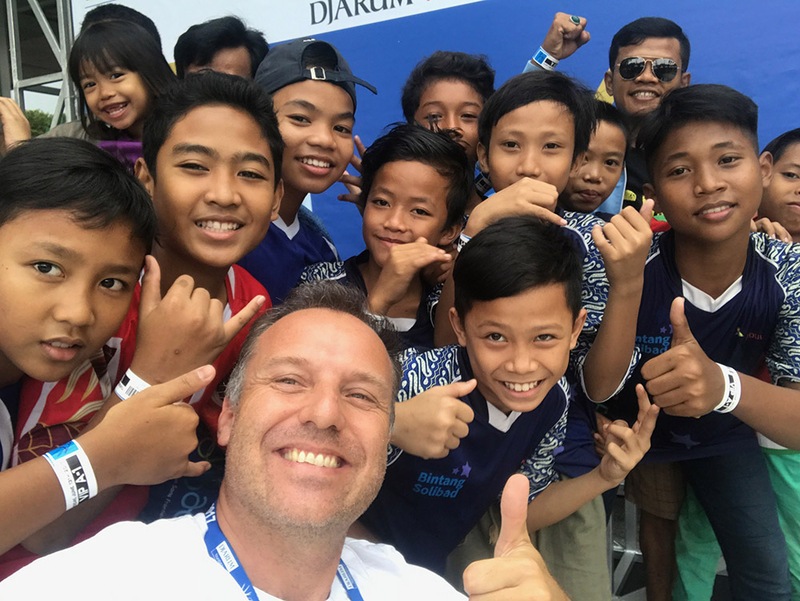 Last year, Freek, the Dutch Umpire, Gronya, our Ambassador from Australia, Rexy and Firda from Indonesia, Pornchai, our dear friend from Thailand had also taken the time to come see the children of Bekasi, and I know some of my friends from the tour, players and officials, wished they could go too. I hope they will, someday, to realize how grateful they – we – all have to be. This week, during the Indonesian Open Badminton Championships, children from Bekasi but also from Pati or Yogjakarta were invited by PBSI to see the matches. You should see the sparkles in their eyes. Some of them had never left their village, and here they are, in the big city, watching amazing athletes – some they’ve seen on TV. Some they’ve just heard of, from their coaches, when they train in the dust, at home. What a feeling to see all these little faces with a smile, with their eyes wide open to catch every moment of what will probably remain a lifetime memory. They were just so happy to meet with some of the stars – Soniia, our new ambassador from Malaysia who explained to the kids her daily life a a top athlete, and some others who took the time to sign their shirt, pose for a photo with them.